Another Hurricane Hectic hit Nailed It headquarters. I've been so unbelievably lucky to have experienced what I have, and met the people that I have. Unfortunately, that meant the blog fell by the wayside, but it's back, and there's glitter. I got this design idea from A Girl and Her Polish. She just posted a similar design in her post, Sand Art in My Snow. I wanted to almost entirely imitate it, but when I opened up my drawer to pull out Sand Art, I ran into another sandy glitter polish. This one is from Naild'it Unique Polish, and it's called Vegas Sands. It's shocking how similar the two polishes are. I also decided to use My Boyfriend Scales Walls instead of Alpine Snow, keeping with the OPI theme. Thanks for the idea girl! So pretty! The glitter pops against the white! Oh my, I love this. The matte glitter on a white base looks so so good. This is so cute! Luckily I have both of these and can try this out! I'm a new follower & now I'm absolutely obsessed with your blog. 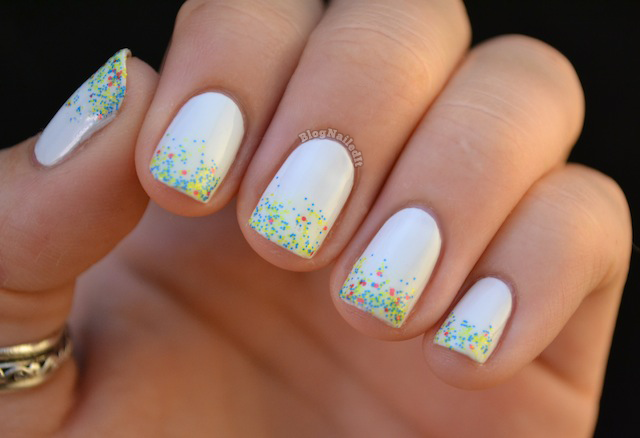 Your nails are the perfect length & shape! Its funny all these years and your mani's still give good inspection. I checked *sand art in the snow, but honestly I like yours most. The other is a bit to glittery, especially with the green. Your mani is very nice.